I've been trying to sit down for days and write this blog post. Every time I started editing photos I either got hungry or wanted to cry, because I want to go back. It also took me way longer than I expected, but hopefully there is some useful information if you are planning a trip! I knew I wanted to check out Barcelona when I was making my list of places I wanted to travel to this semester, but I can't say I dreamed much about it. However, as plans for Brendan flying here for his spring break started coming together, he told me that he really wanted to go to Barcelona. We were able to work it that he flew in to London at the beginning of his spring break, stayed with me in sadpartment while I had classes for 3 days, then together we would fly to Barcelona, where then he would fly back State side. So bright and early on Thursday, after aprox. 1.5 hours of sleep we set off to Barcelona. When we arrived, we were dead tired- I couldn't sleep on the plane because the seats are so close that my torso is too long to fold forward and sleep on the tray table. Poor BShuggs had to deal with me being even more restless than usual in my attempts to sleep. But we rallied upon landing and caught the Aerobus from the airport in to Placa de Catalunya where we walked to the El Born neighborhood. Even that first hour in Barcelona felt wonderful, the air just smelled better, and the streets seemed so lively yet relaxed. We had an hour and a half or so until we were to meet Esteve, our Airbnb host, so we found where the apartment was and made it maybe 500 feet before we came upon a cathedral and a bunch of tapas restaurants. We sat down outside in the sunshine, drank some verdejo wine, ate cheese covered in olive oil and ham croquettes. If you order two glasses of wine and they bring you the bottle, it is not a misunderstanding they are trying to trick you into pouring more and in turn buying the bottle. At most places sitting outside has an extra 15% charge on your bill. If you are trying to keep to a tight budget sit inside however pick a place with a charming street on a nice day and sit outside, its worth every penny/euro. After getting very stuffed on just 3 croquettes and 4 slices of cheese, we wandered back up our street where Esteve was waiting for us. He took us up a tight spiral staircase that reminded me more of the inside of a shell, and into our little Airbnb where he greeted us warmly, gave us the usual rundown of the place and told us not to hesitate to contact him. Fortunately for us we didn't have to, because the place was perfectly simple and exactly what we needed- I'd highly recommend to stay there if you are visiting Barcelona. Then we napped on and off for about three hours, before getting hungry again. We wandered out toward the water, and were entertained looking at all of the sailboats and mega yahts in the port. Brendan and I made it to the beach right as it was getting dark and Barcelona was lighting up, it was the first time I really felt how far we had traveled. In the search of food we ended up making our way back towards our Airbnb to find that just behind the cathedral we stopped by for lunch, was a main street Passeig del Born, with tons of places to choose from. We had ended up having these egg and fry bowls with chorizo and pork jowl (!) which seemed oddly appropriate post evening nap. The following morning, we had a delightfully slow and sunny morning and set out to get breakfast on our new favorite street. As we waited for Caitlin and Pflieger's flight to get in, Brendan and I popped in to the Cathedral, which was magnificent and a nice place to pop in for free. We stayed until a gentleman started jingling keys at everyone and waving his hands to say get out. 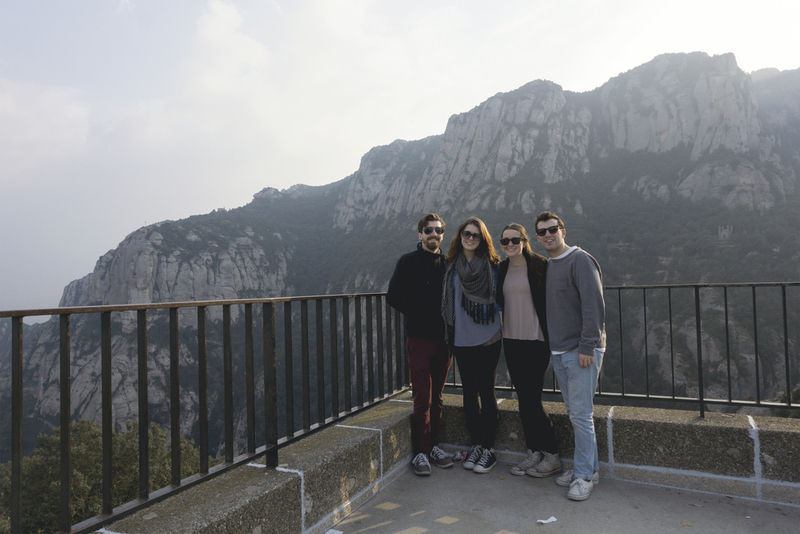 Once we heard from Caitlin and Plflieger, we realized that our original plan to meet up with them and go to the monastery at Montserrat probably wasn't going to work out. So Brendan and I decided we were going to head out and forge our way there since Friday was looking like the nicest day weather wise. Taking the metro system in Barcelona is relatively simple and they offer a couple day pass options, as well as a 10 trip pass. Once at Placa Espanya you are able to buy your train ticket to Montserrat and select if you want to take the cable car or the funicular, we opted for the cable car. It's worth noting that once you pick one, you can't change your mind as the tickets aren't interchangeable. All of us had a pretty hard time figuring out what time the last cable car and train went back to Barcelona online, so be warned if you are on a tight schedule. However once we arrive at the cable car, we were given a little time table. 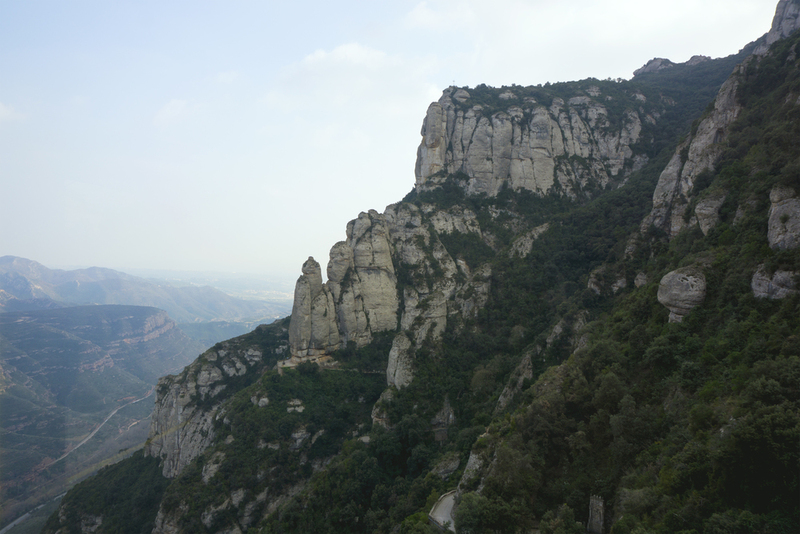 Montserrat itself was gorgeous, it's about an hour train ride and well worth it I'd say. If we had been a little better prepared, we would have loved to hike some of the trails, but almost all of them were about 2 hours. You're going to want to be at least mildly prepared with water, a rain coat and sturdy shoes (none of which we had) however walking around the monastery is still very enjoyable. We found out that the block sculpture that is commonly photographed was actually under construction, but don't let that stop you!! I think because we got up there rather late, the options for grabbing food were rather slim. So we raided the huge gift shop for a random assortment of snacks to eat as we walked around some more. While wandering down a different path, we quite literally ran into Caitlin and Pflieger, the sun came out and we took what is now one of my favorite pictures at an overlook by the blocks. After parting ways with Caitlin and Pflieger, Brendan and made it to Casa Mila right at the end of the day. We were warned that the building was closing soon and that we might not have enough time. However, we made it through in about an hour and loved the fact that it wasn't crowded. The view over Barcelona as night fell was gorgeous and the lighting showed off just how wild the sculptures are. The second and third levels (down from the top) that you visit are a museum and apartment, we probably ran through them a little fast with the time crunch but the miniatures, renderings and actual chairs were great to look at. I love checking out places like this with Brendan, we get to let our inner design nerds out, and end up entertaining ourselves for far too long talking about furniture. After we met up for dinner on Passeig del Born for dinner at Casa Delfin for tapas, the little peppers on the menu reminded me of shishito peppers that my cousin Aaron turned me on to. We then went to Alsur Cafe, it felt like drinking in a coffee shop, I could see myself meeting friends there if I was a local. We decided to try and go out for a night, I really wanted to do some dancing with the locals. But instead we ended up at Club Mix, where the DJ looked like an awkward Stellan Skarsgard and one of the waitresses dropped a glass at our feet right when we walked up to the bad. Overall the place was... funny, everyone felt like they had passed their prime but were determined to still have a fun night out. My favorite song they played that night was Hit the Road Jack, I think he was spinning his awkward family wedding mixes. Brendan and I stopped for gelato on our way home though, so it was all okay. The second morning, I must confess we were a little lazy. But the forecast predicted rain so we didn't feel too guilty for sticking around in bed longer than we had planned. After Brendan brought me coffee in bed (he knows the way to my heart) we gathered ourselves together and set off for la Placa de la Boqueria, also known as the market. We food-gasmed, its really the only way I can describe it. There was so much food, all colorful out on display smelling wonderful, the hardest part is deciding. Naturally, we decided to keep trying everything and made walking laps around the market our late brunch. The cured meats, I should have mentioned it sooner, but I really needed to devote a paragraph to confessing my love for them. Spain knows how to cure meat and you should absolutely eat lots of it. We had a cone of Iberian ham at the market and it was delicious, I don't understand why there aren't cones filled with meat on every street corner. I think we ended up getting some kind of cured meat with every meal just because it was that good. After returning to our apartment to ride out another wave of rain, we met up for a late dinner with Caitlin and Pflieger at Can Cisa. This restaurant probably ranks in my top 10 favorite places I have been, the atmosphere was warm and inviting despite it being larger than a lot of the places we had been. Our waiter provided us with a selection of three wines that would pair well with our dinner, and we tried a Catalan wine that had a really nice unusual flavor. All of the tapas that I had that weekend were very good, but this place was absolutely delicious, they have a section of their menu devoted to burrata. Which sent Caitlin overboard, we ordered it first but through some mix up we ended up getting it last, but I'll have burrata for dessert any time. Though Can Cisa is not cheap, a bottle of wine, four entrees and two salads, split between four people ended up being about 25 Euros each. Please go there. As if we weren't full enough, we went down our favorite street again to get gelato and skinny salami sandwiches. Gelato is the perfect way to end any night. It was a bittersweet day, Brendan had to take of on a morning flight. Its always hard to say bye when we aren't sure of the next time we will see each other, and I felt horrible sending him back to snowy Syracuse on a sunny morning. After a sad parting, I moved my things out of the Airbnb Brendan and I were in and into Caitlin's Airbnb, Pflieger had left that morning too. Together, we met up with our other roommate from London, Micheal, and walked around for a while in the Parc de la Ciutadella, with one of the most beautiful fountains I have ever seen. We were craving a walk on the beach and I was determined to try paella, so we wandered rather indirectly there. Within moments of reaching the beach we smelled something delicious, set down on the sandy beach is a restauran. After checking that they had paella (lobster!) we decided to sit and enjoy the sun and view, with our new fav Spanish term, cava. And that is how we ended up eating lobsters with champagne on the beach in Barcelona, pricy meal, but I will remember how perfect it was forever. As the sun went down, it started to cool off and Caitlin and I needed some serious time to siesta and digest. We lounged around a little, made some hot coco and talked about how full we were. We told Micheal that we would meet him for dinner, so we met at Tosca for light tapas and drinks around the corner. We were stuffed, but with it being out last meal in Barcelona we ended up ordering like half the menu again, classic. And guess what? We ate it all again, food is everything. At Tosca the bartenders were super friendly, they made our last night very enjoyable, and the place has free wifi, I don't think they have a website but they have a couple locations, so go check them out. I love Barcelona, and kept telling myself I know I'm going to come back, so don't try to squeeze everything in. Which is a reality now, as my mom and I have it on our Epic Euro Tour that we are taking at the end of my semester. I can't wait to go back and show her some of the places I loved, and check out more things that I didn't make it to the first time around. I also want to thank a high school friend of mine, Rachel, her blog got me all kinds of excited for heading to Barcelona. If you are needing some more Barcelona (or other cool travel inspiration) after this post check out her blog here. Has anyone else been to Barcelona? What were some of your favorite places you visited?